One of the most common questions every experienced MT4 user will definitely ask is about how much one pip movement is worth in the needed currency. 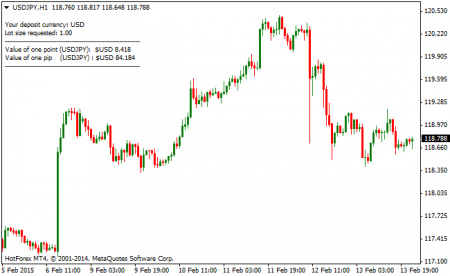 This issue remains to be one of the most often widespread, according to forex community and hundreds of MQL forums. The matter is that knowing how much a 1 point or 1 pip moves on a currency is still extremely important factor in any trade on currency exchange markets. If you don't know that parameter, you will not be able to calculate the risk to reward. You can either use the calculator for a handy tool, or use the provided formula for your own EA and finance management strategies. The code is provided as open source and is completely free. The only thing you need to input is the lot size you are going to trade. Enter this value and everything else will be calculated for you automatically. ECN and standard brokers are taken into account in the calculations. Copy and paste code on any chart, fill in the lot size and the values of that chart pair will be printed out in the top left of your screen. 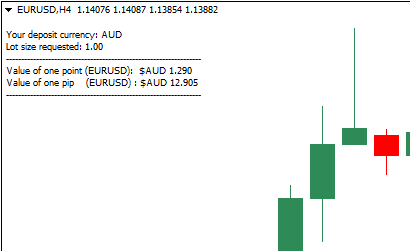 You will need to add the pip value MT4 indicator to the needed chart and it automatically count the value of 1 pip for your currency. Moreover, you are free to use the indicator input box for changing the desired lot size. 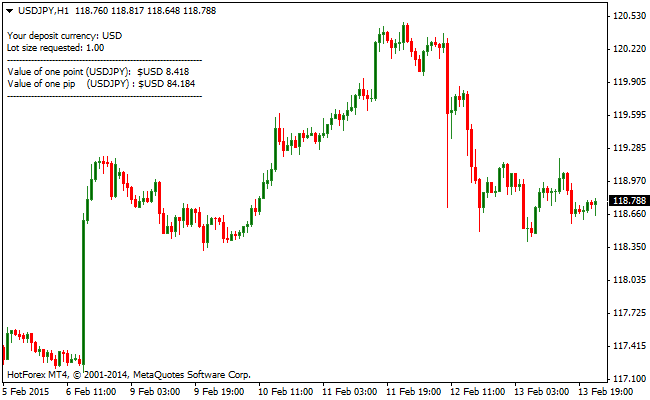 An indicator works perfectly with any currency pairs, sessions and time frames. It also offers plenty of additional parameters, such as color, lot size, etc. If you need to calculate pip value in MT4, these two methods are the simplest and the most popular among traders on currency exchange markets.